March 15. The Ides of March. And your world feels every manner of wonky. I know this to be true because we talked or texted or Facebook messaged this week and my heart is full of hurt for you and yours. That ex-husband who dumped a load of legal papers into your mailbox on what would have been your anniversary? Revenge is mine, saith the Lord, but merciful Father couldn’t we get just a piece of it? Your only daughter with her broken back. Your mother in agony of bone. Lord have pity, they have been through enough. Your son-in-law who took the income tax refund his family was desperate for and spent it all on a 90 inch TV to watch while he refuses to look for a job. I want to march over there with you, fierce warrior mama, and crack that TV right over his worthless head. BELOVED. Yes, you, and your precious children too. The cover story in last week’s edition of the Smoky Mountain News has been nudging my soul, elbowing my ribs that God has that word for you. It’s about a woman nearing 80 who lives in Snowbird, a Cherokee community not far from here. They don’t take pictures in these parts, they make them, and the one they made arrests me, brings me up on charges of gawking. You’ve never heard of her, you say. She’s not in Wikipedia and the national news has never mentioned her. How can they with crazed killers, perfidious politicians and suchlike grabbing us by the chin and forcing us to look at their ugly doings? But here in the Smokies, a quiet woman from Snowbird is the headliner. Education? 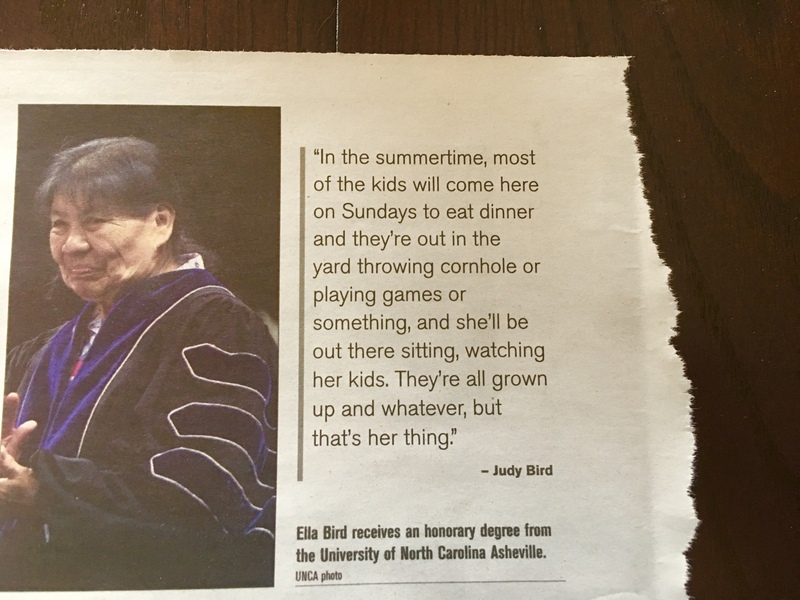 Ella Bird never went beyond the seventh grade at her Snowbird school established by the Bureau of Indian Affairs, but the photo captures her in full academic regalia, resplendent in a black gown and purple velvet hood as she receives an honorary doctorate from the University of North Carolina Asheville. Group harmony? Ella raised her five daughters and five sons with help from her mother, hubbie sometimes present but income mostly absent. Despite the privation, members of her community point out with pride that none of Ella’s children fell victim to the true enemies of their people: drugs and alcohol. According to the tribe’s website, only 10 people have been honored as a Beloved Man or Beloved Woman in the last 75 years. Ella Bird is one. My white immigrant-American culture has no such honorifics, and yet? We worship the same God Ella does. The God of Abraham, Isaac and Jacob. The God of Sarah, Rebekah and Rachel. The history-making, creation-begetting God of Holy Scripture. Red and yellow, black and white, we are all precious in his sight. And you know what He calls us? Each and every one of us? Such a tribute! You made me cry with such a story as we so rarely hear of “the over-comers” because so much press time is devoted to “elites” whose god Is themselves. This is another one of the reasons why we need to give God the glory more often and not feature His adversary and ours. The headlines so often Turn our thoughts to the evil in this world and takes away our joy in Jesus. May God bless this lady and those who so generously honored her. Bless you all as we look forward to Spring and the celebration of The Greatest Gift of all- Jesus’ death and resurrection for our sin not His. I am guessing you are starting to see the grass greening, the trees budding and the temperatures rising. Not so much here but I am looking forward to it. Please pray that my condo will sell VERY SOON so I can get moving into Windsor Park in the next 3 weeks. We are getting to “crunch time”. I know God will work it out in His way and Just need to Keep Trusting Him. Bev, thank you for reading and commenting. You are always such an encourager. Please know we will be praying earnestly for the sale of your home in time for you to move into Windsor. Wish we were nearby to help. How wonderful that you know the person who wrote the article and interviewed Ella! Small world indeed. I don’t know if the Smoky Mountain News has a digital edition but if so I can link it to this piece to credit the journalist. Maggie, this really resonates with me. As missionaries we always resisted being put on a pedestal. I truly believe that when we stand before the throne, there will be many before us. I think of an elderly couple we met in Maine. They shared lunch with us in their tiny apartment. Their faces shone as they told us about the unexpected refund check that came just when they were wondering how they would fulfill their faith promise for missions. No thought of what they might spend it on, it was God’s answer to their faith. And the woman who wrote me about waking up in the night with the conviction that she must pray for me. it was just the time when I was in a car accident in the mountains that could have been fatal for me and my daughter. God has so many unknown and unsung heroes who just keep on faithfully trusting Him through huge challenges -some right now in prison camps in China and other places because they are faithful to Him. Thank you for another excellent blog post. What a wonderful word of inspiration and encouragement!